Breysse, Paris, by 1875. Jean-Baptiste Faure [1830-1914], Paris; (his sale, Hôtel Drouot, 29 April 1878, no. 15). Jules Paton, Paris, by 1884. Acquired 1906 by (Boussod Valadon et Cie., successeur de Goupil et. Cie, Paris); sold 1908 to Josse et Gaston Bernheim; in the private collection of Bernheim-Jeune, Paris, by 1909; purchased June 1931 through (Etienne Bignou) by Chester Dale [1883-1962], New York; bequest 1963 to NGA. Lent by Breysse to Exposition de l'oeuvre de Corot, Ecole des Beaux-Arts, Paris, 1875, no. 52, as Etude de femme. According to Chester Dale papers in NGA curatorial files. The painting does not appear in the only recorded sale of the Paton collection, held 24 April 1883. Goupil et. Cie/Boussod Valadon et. Cie Stock Book no. 15, p. 165, no. 28865, Getty Research Institute. Lent by Bernheim-Jeune to Rétrospective de figures de Corot, Salon d'Autumne, Paris, 1909, no. 11, as l'Italienne Agostina, according to Chester Dale papers in NGA curatorial files. A photograph of this painting is included among the albums from the gallery of Etienne Bignou now at the Documentation, Musée d'Orsay, Paris (copies in NGA curatorial files), which suggests that Bignou was in possession of the picture at one time, probably in conjunction with Bernheim-Jeune. A letter dated 7 August 1931 from Bignou to M. Knoedler & Co., New York, details shipping instructons, M. Knoedler & Co. Records, Getty Research Institute (copy NGA curatorial files). Portraits et figures de femmes--Ingres à Picasso, Galerie La Renaissance, Paris, 1928, no. 43, repro. French Romanticism, National Gallery of Art, Washington, D.C., 1979, unnumbered checklist. Daliphard. E. L'Art II (1875): repro. p. 257. Robaut, Alfred, and Etienne Moreau-Nélaton. L'Oeuvre de Corot. Catalogue raisonné et illustré. 5 vols. Paris, 1905: 3:114, no. 1562 as L'Italienne Agostina. Gensel, Walther. Corot und Troyon. Leipzig, 1906: pl. 45. Mourey, Gabriel. "Une Exposition d'art français à Londres." Les Arts 66 (June 1907): 24, repro. Bouyer, Raymond. "Corot, peintre de figures." La Revue de l'art ancien et moderne II (1909): 204. Goujon, Pierre. "Corot, peintre de figures." Gazette des Beaux-Arts II (1909): 480. L'Art Moderne et quelques aspects de l'art d'autrefois. Paris, Bernheim-Jeune, 1919: pl. 35. Oppo, Cipriano. Corot. Paris, 1925: 20, repro., as Portrait de femme. The Arts VIII, no. 2 (August 1925): 60, repro. Jourdain, F. Le Salon d'Automne. Paris, 1926: 66. Alexandre, Arsene. "Portraits et figures de femmes, Ingres à Picasso." La Renaissance XI, no. 7 (July 1928): 261, fig. 43. Bernheim de Villers, G. Corot, peintre de figures. Paris, 1930: 62, 69, no. 51, repro. and frontispiece. Meier-Graefe, Julius. Corot, mit 153 Tafeln in Lichtdruck. Berlin, 1930: 100-102, pl. CXI. Faure, Emile. Corot. Paris, 1931: pl. 65; 2nd ed., Paris, 1938: pl. 50. Mauclair, Camille. Corot. Berlin, 1931: 56, repro. Bazin, Germain. "Corot et son oeuvre." L'Amour de l'art 18 (1936): fig 91. Hazama, I. Corot. Tokyo, 1936: pl. 50. Jamot, Paul. Corot. Paris, 1936: repro. 45. Pemberton, Murdock. "Ambassador to Art." Esquire (February 1938): repro. Catalogue of French Paintings from the Chester Dale Collection. National Gallery of Art, Washington, 1941: 2-3, pl. IV. National Gallery of Art. Art Series: French Painting. Description of Paintings for Art Series Number 7 [of 9]. Programs of the General Federation of Women's Clubs, 1941-1944. Washington, 1941-1944(? ): 2, 5. Dale, Chester. "The Golden Century of French Art." The New York Times Magazine 17 May 1942: 20, repro. French Paintings from the Chester Dale Collection. National Gallery of Art, Washington, 1942: 19, repro. Sater, Katherine. "Great Paintings Shown At National Gallery." The Columbus (Ohio) Citizen (13 December 1941): 4, repro. Cairns, Huntington, and John Walker, eds. Masterpieces of Painting from the National Gallery of Art. New York, 1944: 156, color repro. French Paintings from the Chester Dale Collection. National Gallery of Art, Washington, 1944: color frontispiece, 19, repro. Jewell, Edward Alden. French Impressionists and their Contemporaries Represented in American Collections. New York, 1944: repro. 49. Pierre Courthion. 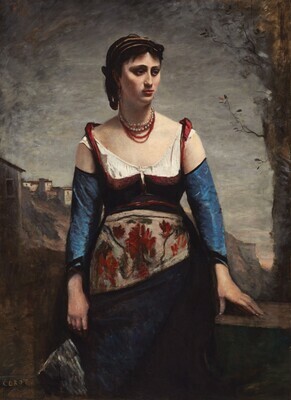 Corot, raconté par lui-même et par ses amis. Geneva, 1946: repro. opposite 108. Kimball, Fisk and Lionello Venturi. Great Paintings in America. New York, 1948: 168, pl. 77. Bazin, Germain. Corot. Paris, 1951: 112. Morse, John D. "Corot as a Figure Painter." The American Artist 15 (November 1951): 28, repro. 26. French Paintings from the Chester Dale Collection. National Gallery of Art, Washington, 1953: 27, repro. Cooke, Hereward Lester. Galeria Nacional de Washington. Madrid, 1955: 323, no. 77, repro. (German ed., 1971: 51, color repro. 50). Walker, John. National Gallery of Art, Washington. New York, 1956: 31. Baud-Bovy, Daniel. Corot. Geneva, 1957: 126. The National Gallery of Art and Its Collections. Foreword by Perry B. Cott and notes by Otto Stelzer. National Gallery of Art, Washington (undated, 1960s): 9, repro. 3. Walker, John. A Colorslide Tour of the National Gallery of Art, Washington. New York, 1960: no. 26, repro. Walker, John. National Gallery of Art, Washington, D.C. New York, 1963 (reprinted 1964 in French, German, and Spanish): 246, repro. Eighteenth and Nineteenth Century Paintings & Sculpture of the French School in the Chester Dale Collection, National Gallery of Art, Washington, 1965: 40, repro. Summary Catalogue of European Paintings and Sculpture. National Gallery of Art, Washington, 1965: 31. Cairns, Huntington, and John Walker, eds. A Pageant of Painting from the National Gallery of Art. 2 vols. New York, 1966: 2: 412, color repro. Dauberville, Henry. La Batille de l'impressionisme. Paris, 1967: 542, repro. European Paintings and Sculpture, Illustrations. National Gallery of Art, Washington, 1968: 23, repro. Giampaolo Gandolfo et al. National Gallery of Art, Washington. Great Museums of the World. New York, 1968: 75-76, color repro. (Italian ed., Milan, 1968: 75-76, color repro.). Hours, Madeleine. Jean-Baptise-Camille Corot. New York, 1972: 145, repro. Walker, John. Self Portrait with Donors: Confessions of an Art Collector. Boston, 1974: 166-167, repro. European Paintings: An Illustrated Summary Catalogue. National Gallery of Art, Washington, 1975: 78, repro. Walker, John. National Gallery of Art, Washington. New York, 1975: 430, no. 619, color repro. 431. Sinjo, Y and H. Harado. Corot, Courbet (The Book of Great Masters). Tokyo, 1978: 139, pl. 26. Leymarie, Jean. Corot. Geneva, 1979: 137, repro. Hours, Madeleine. Jean-Baptiste-Camille Corot. New York, 1984: 108-109, repro. Walker, John. National Gallery of Art, Washington. Rev. ed. New York, 1984: 426, no. 607, color repro. European Paintings: An Illustrated Catalogue. National Gallery of Art, Washington, 1985: 97, repro. Kopper, Philip. America's National Gallery of Art: A Gift to the Nation. New York, 1991: 239, 246. Feist, Peter H. Malerei des Impressionismus. 2 vols. Cologne, 1992: I: 286, repro. Eitner, Lorenz. French Paintings of the Nineteenth Century, Part I: Before Impressionism. The Collections of the National Gallery of Art Systematic Catalogue. Washington, D.C., 2000: 61-67, color repro. Brettell, Richard R., and Stephen F. Eisenman. Nineteenth-Century Art in the Norton Simon Museum. New Haven and London, 2006: 111 fig. 23d.